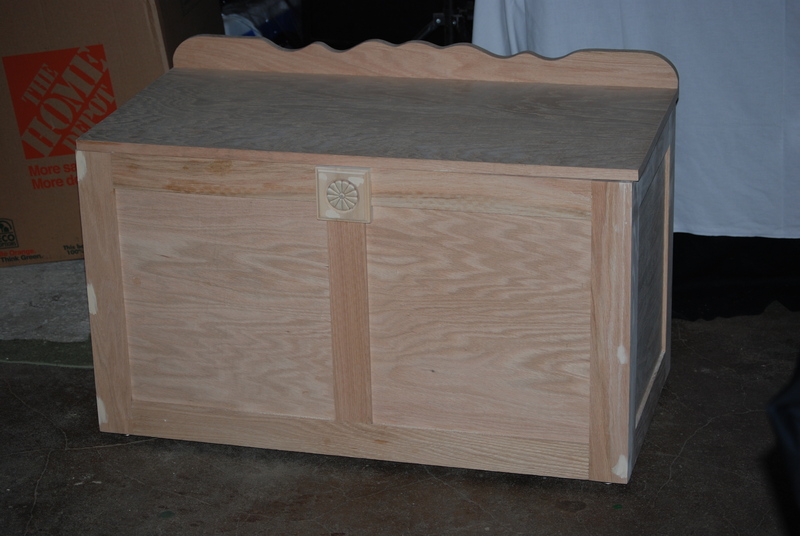 I have been commissioned to make two Blanket Boxes. They ordered them for a Christmas present for their daughters. It started with a picture from the internet of a box they liked and then was tweaked along the way. It is a combination of the internet box and a earlier piece that I had made. The construction was going to be a panel type with 1×3’s for the framing and some 1/4 inch ply for the panels. I was planning on using biscuits and had made a deal to get a bisquit joiner by trading a GoPro 2 camera that I bought and ended up not using. The camera just didn’t work for taking video of the woodworking out of my one car garage. I had thought that since it has such a wide angle lens it would be perfect but this is not the case. By the garage being so tight there was a tremendous amount of fish eye and the video looked terrible. I thought that I could take that out by cropping but that is a lot of work. Plus it still looked very bad. So I traded that for a brand new Porter Cable biscuit joiner that some one needed for just one project of about 20 bisquits. This has set me back on my You Tube channel but good timimg for a joiner I thought. Well after some talk it was decided that they wanted the boxes to be cedar lined and after I had a chance to think about it I decided to go with pocket screws. 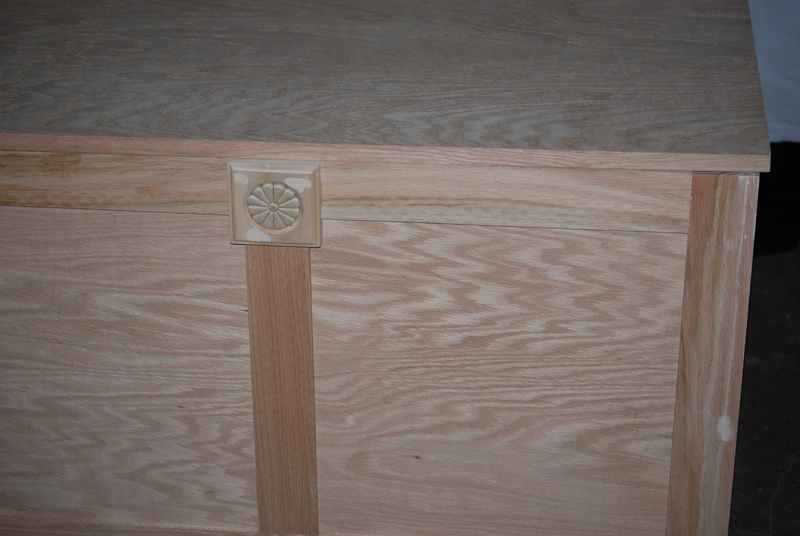 Since the cedar will be lining the box and no one will see the inside of the oak I thought it a perfect way to go. 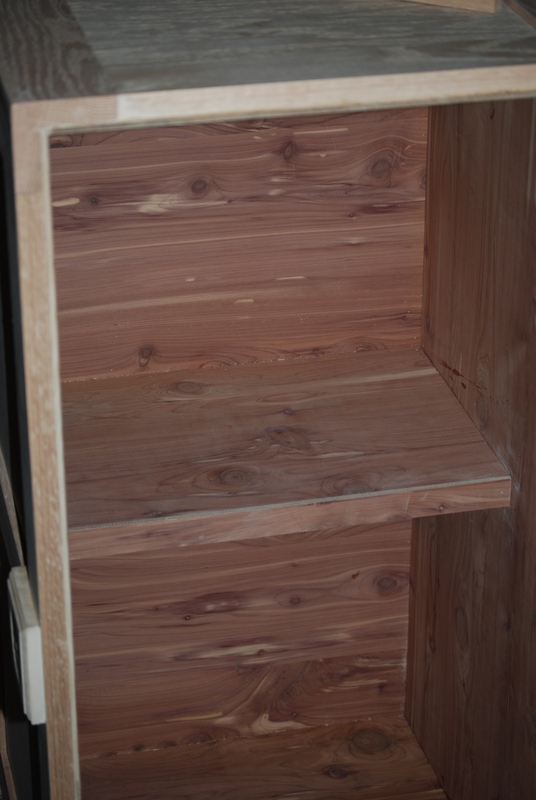 Plus I decided to use 1/2 inch ply in a dado for the panels so the cedar had something more to be glued to and would not be damaged by accident. With the 1/4 inch panel in the center of a 3/4 inch thick stile there would have been a gap between the cedar and the panel which I didn’t like. This did make the boxes heavier but I thought it necessary. As for the biscuit joiner I am not disappointed with the deal I will use that tool a lot. It is great for making panels up. So everything has gone very well except for one lid. I ended up cutting it to short somehow. I do not even know how I did it. I keep thinking back and still can’t figure out how I did it. I had to go and buy a $20.00 piece of plywood to make another one which did not make me happy at all. There was one other issue and that was the feet that they wanted on them. The package said to use a 3/8 bit to drill the insert hole, which I did, well that ended up being to big. So now I have to fix those but it won’t be hard. The only issue is that I still ahve a final sandind and to clear them by Christmas. This is cutting it very close and I don’t like that. So wish me luck and I hope everyone has a great Holiday Season! Thanks for stopping by!